Fig. 5.3.1 (a) T/S diagram from Iselin (1939) showing the T/S relationship along the sea surface in winter in the western North Atlantic (open squares) and at depth (the solid line labelled Sargasso Sea) and along the sea surface in winter in the central North Atlantic (open circles) and at depth (the solid line labelled Eastern North Atlantic). Note that the surface and subsurface T/S relationships are similar over only a small portion of the total temperature range shown. (b) T/S diagram from a seasonally varying model of the North Atlantic (heavy solid line and symbols) by Williams et al. (1995).The squares are summer surface data, and the circles are winter surface data; the latter lie directly upon a vertical T/S profile from the same region (solid line).The similar dashed line is a T/S vertical profile from an ocean climatology. From Williams et al. (1995), Fig. 9.
that atmospheric forcing (and mixing) is confined to within a relatively thin surface layer of the ocean, and vanishes in the stratified water below. 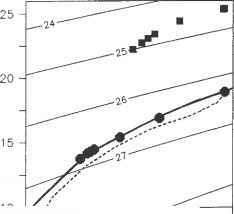 One of the first successful attempts to estimate the three-dimensional mass flux through the thermocline was by Montgomery (1938), who constructed a streamtube model whose lateral boundaries were observed isohalines, and whose upper and lower boundaries were observed density surfaces. This streamtube had an open mouth at the base of the upper ocean Ekman layer, and then followed a path defined by the observed salinity and density fields downward and equatorward into the North Atlantic main thermocline. The mass flux through such a streamtube was found to be roughly consistent with the convergence of the Ekman transport over the streamtube mouth. Montgomery's streamtube model was regional in scope and diagnostic in that it required detailed information on the distribution of the tracers (salinity and density) that are themselves the result of the circulation. Though far from a complete model, Montgomery's streamtube analysis was nevertheless a crucial step in establishing a quantitative connection between wind forcing, tracer fields and the three-dimensional circulation. Another, and crucial, connection between the thermocline circulation and the wind fields is given by the Sverdrup theory that relates the vertical integral of the meridional current (sea surface to seafloor) directly to the wind stress curl. The Sverdrup relation makes no distinction between the directly wind-driven surface layer and the geostrophic (unforced) flow below. The seminal circulation model of Luyten, Pedlosky and Stommel (1983, hereafter, LPS) might be viewed as a model that makes explicit the distinction between the ocean surface layer, which is in direct contact with the atmosphere and thus subject to a stress curl, and the nearly unforced (or adiabatic) thermocline below. The Sverdrup relation for transport was assumed to hold within the thermocline alone, and the thermocline water (represented by a few discrete layers) was assumed to be in contact with the atmosphere at appropriate, specified latitudes. The result was a three-dimensional circulation and thermocline structure that gave remarkable insight into major features of the subtropical thermocline. In particular, the LPS model showed that the ther-mocline circulation could be envisioned as made up of domains having quite distinct dynamics and characteristic paths through the thermocline by virtue of their connection (or not) to the sea surface. In regions that are directly connected to the surface, i.e. that are within a Montgomery stream-tube, the flow can be said to be wind-forced and the regions swept out by such a streamtube are 'ventilated', in the sense that the water along one of these paths was at the sea surface a definite, advective, time in the past. The LPS theory makes detailed predictions for these ventilated portions of the thermocline, and is often referred to as the ventilated thermocline model. There are other extensive regions of the thermocline that are not within a Montgomery streamtube and that are not connected to the sea surface by way of an advec-tive path. These 'unventilated' regions may or may not be at rest; along the eastern boundary of a gyre there are extensive unventilated regions that abut the eastern boundary and extend well out into the basin (Fig. 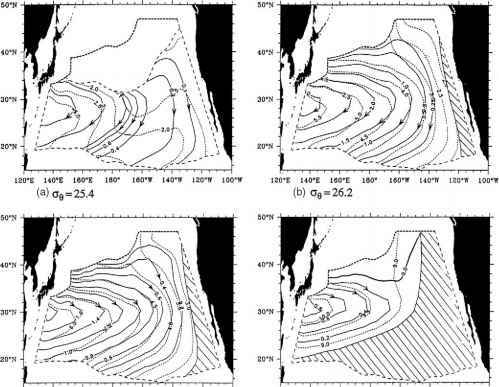 5.3.2 is from a continuous model of the ventilated thermocline developed by Huang and Russell (1995) and having the same dynamics). These eastern regions, called 'shadow zones', have potential vorticity contours that terminate on the boundary, and so are at rest in these models. These eastern shadow zones of the LPS model appear to be analogues of the low-oxygen regions found along the eastern boundaries of most subtropical gyres, and the explanation that the LPS model provides of these regions is one of the most compelling results of the subduction theory. Fig. 5.3.2 Flow patterns on four isopycnal surfaces in the North Pacific computed by a continuous model of the ventilated thermocline due to Huang and Russell (1995).The thin dotted lines are the layer depth in 100s of m.The solid lines with arrows are the volumetric streamfunction. Shaded areas on the eastern edges are shadow zones. From Huang and Russell (1995), Fig. 7.
not be specified (so long as it is not zero and the flux is down gradient). At given latitude, Sverdrup transport occurs within both the central ventilated region and the western, unventilated pool region. The width of the western pool region and the ratio of the meridional transports in the two regions depends upon a number of parameters, including the stratification and the ratio of the meridional scale of the wind stress (the half width of the subtropical wind cell, roughly) and the scale of the variation of the Cori-olis parameter, proportional to the earth's radius but dependent upon latitude. This ratio can be rather small, and thus on a given isopycnal layer only a small fraction of the Sverdrup transport occurs within the directly ventilated region of the thermocline, the rest being within the western pool region. Thus only a fraction of the sea surface is within the 'mouth' of a Montgomery streamtube, typically the central and eastern half of a subtropical gyre. This may be evident in Iselin's subduction diagram (Fig. 5.3.1a). Notice that the central profiles (in depth and along the sea surface) are closely similar over a substantial range of temperatures, roughly 8°C to 16°C. By comparison, the western profiles are not closely similar, and indeed the best match is over the range 15°C to 18°C where the western profile overlaps the central profile. That is, the western profile in depth is more like the central (surface or depth) profiles than the western surface profile. This suggests that to the extent that western thermocline water has an origin at the sea surface in the North Atlantic, then that origin is in the central or eastern subtropical surface layer. This eastward bias of subduction has observable consequences in the evolution of inter-annual Sea Surface Temperature (SST) anomalies (discussed in Section 5.3.4). 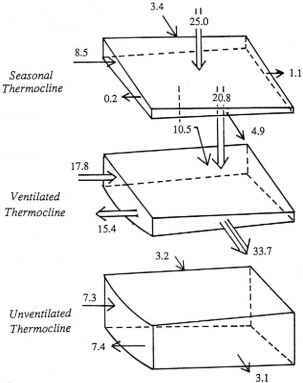 3 What is the thermocline response to interannual variability of surface forcing? (Section 5.3.4). An excellent review of subduction theory up until about 1990 is by Huang (1991). The monograph by Pedlosky (1996) is a masterful treatment of many aspects of large-scale ocean circulation theory, including especially tropical-subtropical connections associated with subduction that are not much discussed here (and see also Liu and Philander, Chapter 4.4). The first steady models of the ventilated thermo-cline took subduction as an observed fact and then proceeded to find the consequences for the Sver-drup flow of the thermocline. It was clear, though, that the subduction process (the passage of water from the surface layer to the main thermocline) must involve the combined effects of upper ocean dynamics, which are highly diabatic, and the gyre circulation. It was expected, too, that the details of where and how much water is subducted must be of consequence to the resulting circulation, and would certainly affect tracer distributions. Indeed, some of the first comparisons of observed, large-scale tracer inventories and tracer ages with the Ekman pumping rate (Sarmiento, 1983; Jenkins, 1987) disclosed that the subduction rate on some isopycnal layers was well in excess of the Ekman pumping rate onto those surfaces, implying a subduction process beyond that envisioned by Montgomery (1938). The subduction rate may be defined as the rate at which water flows downward across a surface defined by the depth of the late winter mixed layer (Cushman-Roisin, 1987; Williams, 1991; Marshall and Nurser, 1992; Marshall et at., 1993a). If that surface were level, then only a vertical velocity would support a flux, and at depths close to the sea surface, the vertical velocity would be due mainly to Ekman pumping. However, in some regions, especially near western boundary currents, the winter mixed-layer depth has a significant horizontal gradient, and in that case a purely horizontal velocity will also carry water from the surface layer into the main thermocline, i.e. cause subduction. This process has been termed 'lateral induction' (Huang, 1991). Over the region just south and east of the Gulf Stream, lateral induction has been estimated to produce about as much subduction as does Ekman pumping alone (Huang, 1990). Lateral induction is slightly less important over the North Pacific because the slope of the winter mixed-layer depth is less than that in the North Atlantic, but nevertheless makes a significant contribution (Huang and Russell, 1995). The basin-scale tilt of the late winter mixed-layer depth must itself be a reflection of the pattern of heat (or buoyancy) exchange between the ocean and atmosphere combined with the large-scale circulation. For example, imagine a water column circulating in a subtropical gyre. In regions where the column receives annual-average surface heating (say in the generally southward flow in the eastern subtropical gyres of the North Atlantic or North Pacific), then the late winter mixed-layer depth will tend to shoal from year-to-year as heat is accumulated above the main thermocline (Fig. 5.3.3; Woods, 1985b; Paillet and Arhan, 1996). This important thermodynamic aspect of the subduction process has been investigated by Marshall and Marshall (1995), Garrett et al. (1995), Speer and Tziperman (1992) and Speer et al. (1995a), and related to kinematic aspects by Marshall et al. (1999). Fig. 5.3.3 A schematic of an upper ocean water column undergoing seasonal cycling and subject to downward Ekman pumping. Subduction is said to occur when water moves from the seasonally affected layer into the main thermocline. During the second winter, the mixed-layer depth is much less than in the first winter, causing significant subduction of water into the main thermocline. If this were a water column circulating within a steady gyre, we might term this subduction process lateral induction. From Williams et al. (1995), Fig. 6.
for subduction. Stommel (1979) provided an explanation of winter selection by describing the effects of seasonal cycling and downward Ekman pumping. 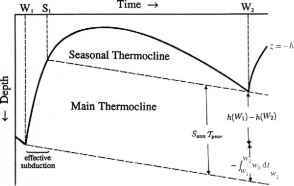 In a region of large amplitude seasonal cycling there will be a temporary subduction of water within the lower seasonal thermocline as the seasonal thermocline builds in spring and early summer (Fig. 5.3.3). During the following winter, most of this water will be entrained again into the deepening winter mixed layer. However, the deepest portion of the winter mixed layer, the amount given roughly by the Ekman pumping displacement (if other non-local effects are omitted), will be pushed downward below the deepest extent of the winter mixed layer, and is thereby subducted into the main thermocline. Thus the combined effects of seasonal cycling of the upper ocean density and steady, downward Ekman pumping will select water from the deepest part of the seasonal thermocline (a water mass formed in late winter) for subduction into the main thermocline. This 'Stommel demon' selection process has been shown by Williams et al. 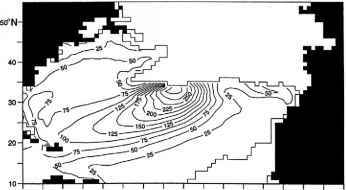 (1995) to operate within a seasonally varying numerical ocean model in very much the way Stommel anticipated (Fig. 5.3.1). Seasonal signals within thermocline tracer fields are thus greatly attenuated when compared with the seasonal cycle at the sea surface. Interannual variations within the thermocline have been detected, however, and interpreted within the light of time-dependent subduction theory (discussed in Section 5.3.4). Fig. 5.3.4 Mass fluxes (units of Sverdups) between layers of the North Pacific thermocline indicated.The northern boundary is to the top, and the Ekman pumping is shown as the downward-directed double arrow. From Huang and Russell (1995), Fig. 12.
which is about 59% of the Sverdrup transport. Over the North Atlantic, the same figure was about 42%. From these results, Huang and Russell (1995) concluded that the North Pacific thermo-cline is less strongly ventilated than is the North Atlantic thermocline, largely a consequence of the smaller lateral induction over the North Pacific. Fig. 5.3.5 (a) Thickness of an isopycnal layer having density 26.7 from the Miami isopycnic model.This is year 30 of an integration having steady wind and surface fluxes.This layer outcrops to the north of the thin line. (b) A vertical section along 45°W in winter showing the 26.7 layer as the shaded region. Note the pronounced thinning of the layer to the south of its subduction latitude (roughly 37°N at this longitude). Partly this results from the section not being aligned with the core of the subducted layer, and partly it results from diffusion of water with lesser thickness into this layer. From New et al. (1995), Figs 10 and 11.
many of the consequences of subduction expected from the LPS theory. Fluid on the a = 26.7 layer is drawn southwards and westwards into the main thermocline as a part of the Sverdrup flow. Along its northern extent the a= 26.7 layer has a fairly large thickness compared with other layers above and below having the same density difference, and in that regard is like a mode water (McCartney, 1982; Siedler et al., 1987; Hazeleger and Drijfhout, 1998; Schmid et al., 2000; and see also Hanawa and Talley, Chapter 5.4) having low potential vorticity (Fig. 5.3.6). For a substantial distance downstream of the subduction region this low Potential Vorticity (PV) forms a tongue that serves to mark the subducted water mass. (In the real North Atlantic there is no strictly comparable mode water formed at this density and general location.) An interesting question is whether the water within this layer conserves potential vorticity, as assumed in the idealized LPS theory. Since the low PV tongue is surrounded by higher PV waters on all sides, there is bound to be some diffusion of (higher) PV into the subducted water mass. This significantly erodes the low PV tongue, which, 5-10 years after subduction, begins to lose its identity. The low potential vorticity is spread by diffusion into the surrounding waters, which thus have a negative potential vorticity diffusion tendency (balanced in this near steady state by horizontal advection). The change of PV within the subducted water is not small, and horizontal diffusion clearly influences the basin-scale distribution of PV (see Toole and McDougall, Chapter 5.2 for a review of mixing in the ocean). 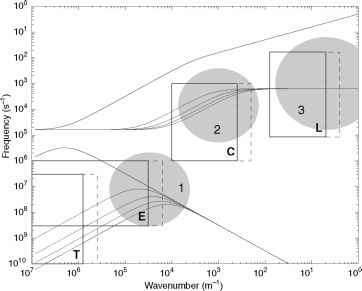 Nevertheless, the overall pattern of thermocline circulation in the numerical model solution is qualitatively as expected from the purely advective (adiabatic) theory of LPS.